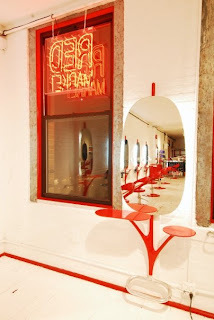 David is the owner and hair stylist of the ultra hip Red Market Salon, the first late night hair salon in NYC. He began his career in Paris 20 years ago at Jacques Dessange and moved to NYC to work at Frederik Fekkai. 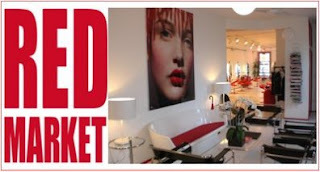 He then opened Red Market in the meatpacking district in a funky loft space and has done fashion shows for Nicole Miller, Christian Dior, Alexander McQueen, and DVF to name a few. In addition to that, he styles rock bands such as Duran Duran, Hot Chips, and many more for editorial. Part of being successful in his business, he feels is to be versatile and passionate in art, fashion, architecture, photography and people. Everyone he hires or works with share that appreciation. David is expanding to other cities ( Miami is next) and is working on product development. This week he is also featured on Style network on their hit show "Split Ends". So definitely check that out! Who are the chicest ladies in NY? Anna Wintour. I like when women have their own personality, sense of humor, and sense of style and No DRAMA!! Women who enjoys life. Trends are ok but they have to fit the personality of the person. Its so tacky when one tries too hard and overdoes it. Simple is elegant and beautiful. My favorite men's store would be hands down Odun on Lafaytte. For women it would Kirna Zabete in Soho. Best Place to go out in NY? I love LES ( lower east side, for all you non New Yorkers). The energy and spirit of this place is cool and unique, I also feel that its underground in many ways like my salon. Check out my tattoo artist, Joshua Lord, at East Side Ink. My favorite restaurant, Les Enfants Terribles is also here. "Too fast to live and too young to die."